Pending Shipment and Shipped correspond only to orders of those specific statuses. All Orders includes orders of all statuses. It's the only selection that shows returned, partially returned, and cancelled orders. Uncaptured Payments displays orders with a Payment Received value of 0 and a Payment Amount greater than 0. Partial Payments displays orders with a Payment Received value greater than 0 but less than the Payment Amount value. To view orders of any other specific status, click Search above the table, type the status of your choice in the Order Status field, and click the blue Search button. You can change order statuses directly from the table view* by pointing to the Order Status heading and clicking the Edit option (if you don't see the Order Status column, you can expose it by clicking the three-dot actions menu icon, selecting Customize Columns, selecting the Order Status check box, and saving). The column then displays a drop-down menu in each row that you can edit freely. You can change an order status from this location or from the order details page (by clicking its ID number from the table view) as many times as you like, unless you cancel the order. To edit the status of a cancelled order, you must first change the status from the table view. *Note that if you've configured your store to receive eBay orders, each eBay order's status must be set to Shipped within the order details page. Do not use the Orders table view to set an eBay order's status to Shipped, or an error will occur. New orders without an automatic payment component default to a status of New. When new orders include customer comments, they show as New – See Order Notes. Some specialized payment methods, such as PayPal Standard, list new orders automatically as Awaiting Payment or Awaiting Payment – See Order Notes. Once you receive payment on a new order, the status changes to Processing. For new orders placed with a credit card, the default status varies depending on your gateway setting. If you use a setting with automatic payment functionality (Authorize and Capture at Sale or Authorize at Sale, Capture at Shipping), declined transactions result in orders with a Cancelled status, whereas successful transactions result in a status of Processing. For all three gateway settings, successful attempts to manually authorize, capture, debit, void, and credit automatically set the status to Processing, and all failed attempts set it to Payment Declined. 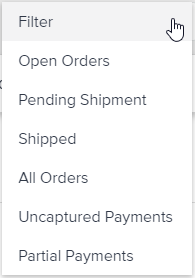 Clicking the Complete Order button from the details page always changes the status to Shipped. Shipped corresponds to the first three statuses in the list above. Orders with a Cancelled status do not appear in the customer's order history. Once you assign an order a status that corresponds to Shipped, the status will not change in the customer's account even if you change it internally to a status that would normally correspond to Processing externally. Note that you cannot add custom order statuses, edit the default selections, or change the way the system automatically switches statuses for certain events, and you cannot change the way statuses display to customers in their account order histories.